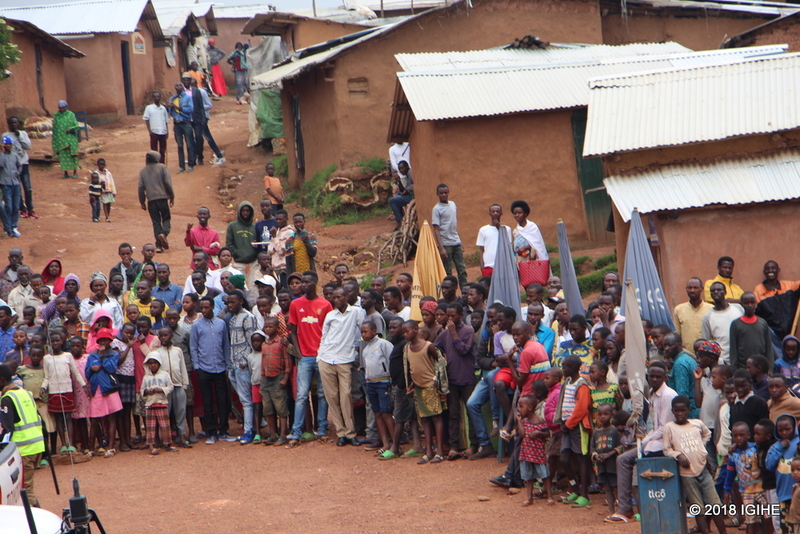 It is neither the matter of insecurity nor any other protection shortage, rather hunger situation and poor lifestyle that push them to seek assistance to leave Rwanda’s Gihembe Refugee Camp to other places where their livelihoods can be improved. They say they might even resort to returning to their mother country, Democratic Republic of Congo (DRC) that they fled over 20 years ago. 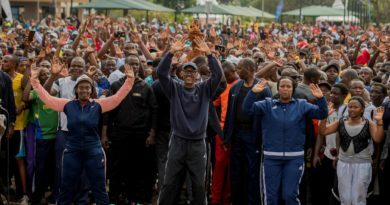 The root cause of the problem has been the reduction of foreign funding that used to cover basic humanitarian needs such as food ratio, education, health and other needs for their survival as these refugees told the United Nations High Commissioner for Refugees (UNHCR) while at his visit to the camp on April 8, 2018. These refugees reached the Gihembe Refugee Camp in 1997 and since then their shelters are too old and their daily survivor is a critical situation as one deserves daily Rwf 180 to survive, which means Rwf 90 for lunch and Rwf 90 for dinner, the situation that looks quite impossible as their total due for a person monthly is Rwf 5,700, imagine how the family with seven people manages such a condition. Chantal Mukamana, widower of seven children got an opportunity to migrate in United States of America (USA) from this refugee camp. 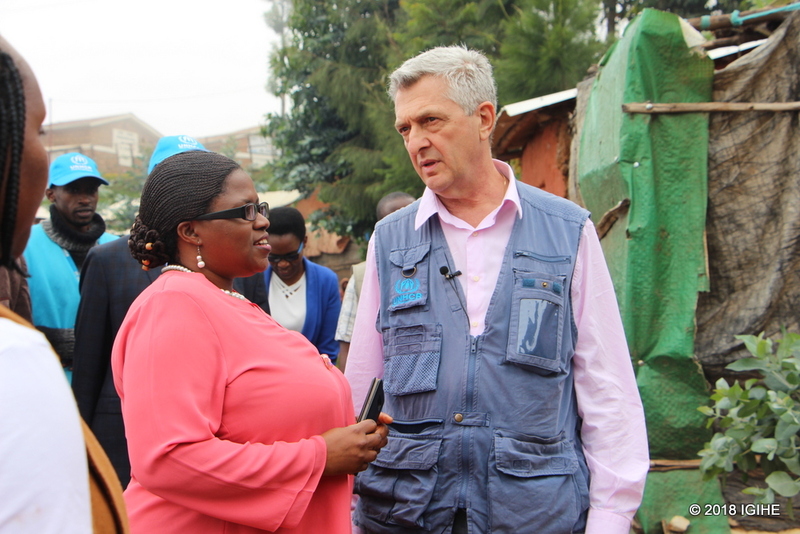 She said it is a privilege to have the UNHCR high commissioner in the camp to tell him all these challenges refugees are facing. “Going in USA will help my children for better education and employment and social security will improve. 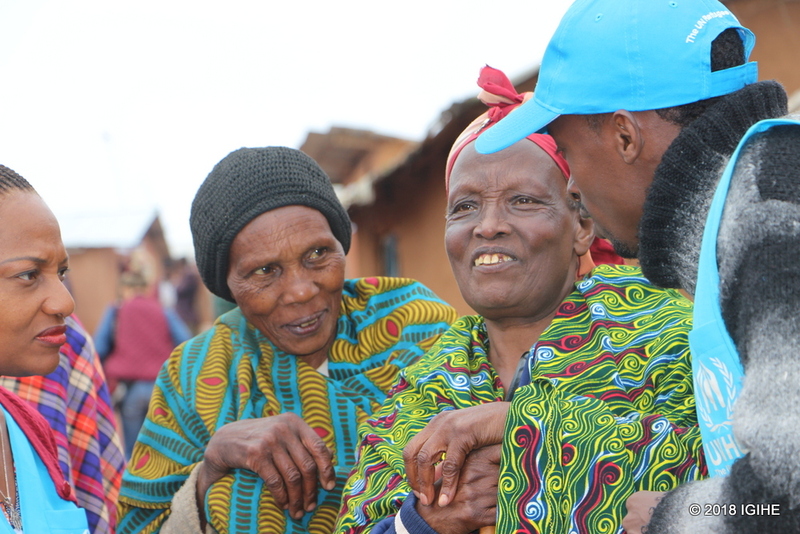 Here they use to help us with little money but not enough for us to survive,” said Mukamana. Moving some of the refugees to the USA is one of sustainable solutions by UNHCR to seek other countries with capacity to host refugees worldwide. They claim food scarcity, poor medication and education on the top of the challenges facing their living conditions. “We request for advocacy to return to our home country if we do not get opportunity to move to other countries with capacity to handle humanitarian crisis. 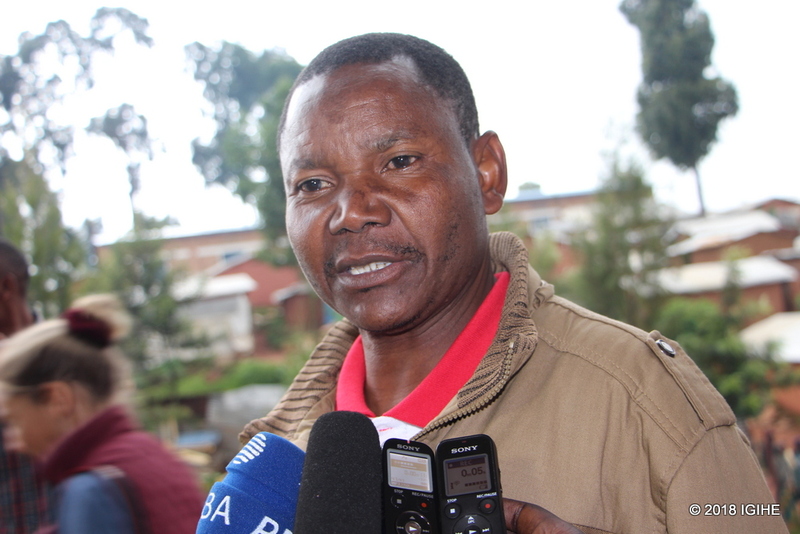 For big diseases, our health keeps being rotten as we lack intervention for treatment,” said Mukamana. Gerald Mihigo, another refugee at this camp said children u-5 years are the most victims as they suffer from anaemia due to lack of good sufficient food. “Many of our people die of anaemia (lack of blood) because of poor nutrition. we wish increase in donations as it reduced gradually since we arrived here,” Mihigo said. “We need go in other countries as we spent many years in Rwanda. We are hungry, everything is bad except security. 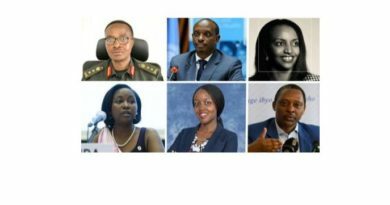 Rwanda tries to help us in whatever but hunger and poor medical treatment remain problems,” said Gahindiro Nuwayo, the mother of five. 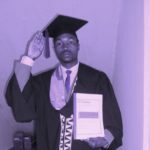 Raphael Fabien Ndayambaje, refugee representative in Gihembe refugee camp said that they are no longer taken to CHUK as it was before the reduction of donations, which result in deaths. Raphael Fabien Ndayambaje, refugee representative in Gihembe refugee camp listing some of the big challenges they are facing. Filippo Grandi, the United Nations High Commissioner for Refugees said they are looking at very diverse refugee situations to find solutions. “They need humanitarian needs like food, sanitation, education and innovative materials, we will talk to the World Food Program (WFP) about food issue. Grandi promised refugees to seek solutions to the problems they are facing. He further noted that UNHCR will make sure they are protected since they request returning home. 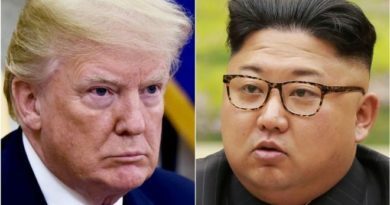 “We must be sure if they have security once they return. 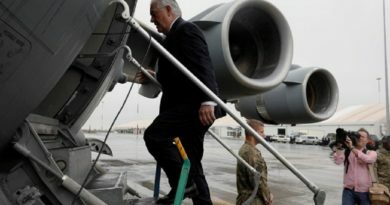 UNHCR will engage discussions with the governments of DRC and Rwanda on their return, we need to address this problem so that refugees can go back,” Grandi said. 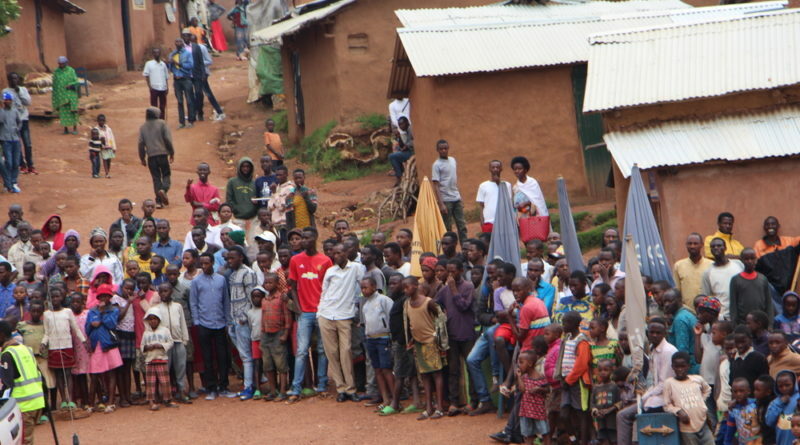 De Bonheur Jeanne d’Arc, Rwanda’s minister for Disasters and Refugees (MIDMAR) said there is a general initiative to find sustainable solutions to refugees’ issues. He said that one of suggested solution is to create vocational training as a milestone to give them income beside the donations. 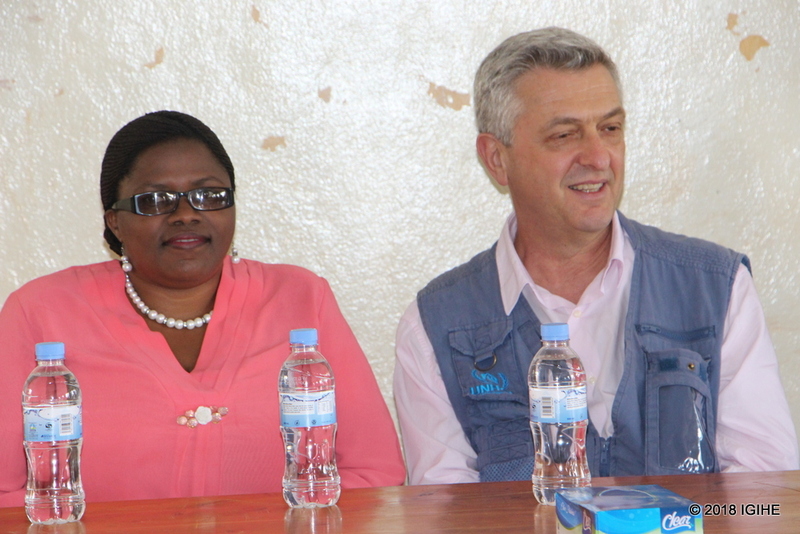 Debonheur Jeanne d’Arc, Rwanda’s Minister for Disasters and Refugees (L) and Filippo Grandi, UNHCR Global representatative responding to the refugees’ questions. 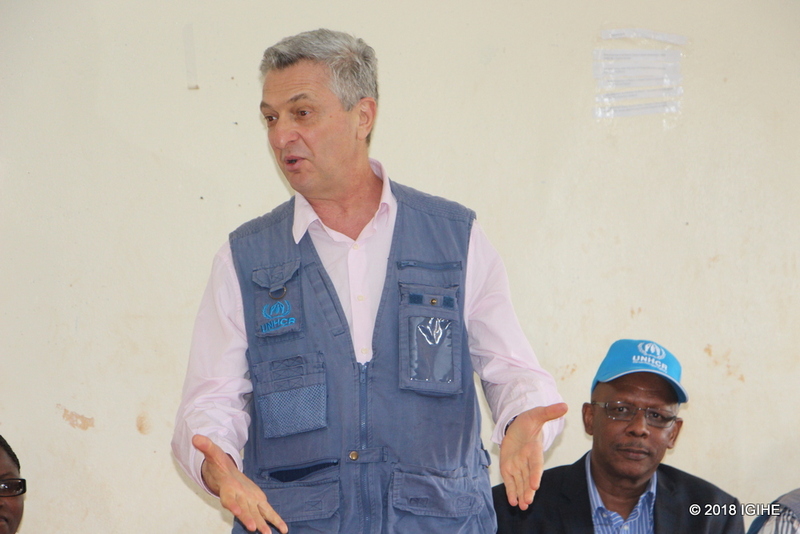 Grandi said that his visit to Africa was in line with seeking sustainable solutions to the problems facing refugees. 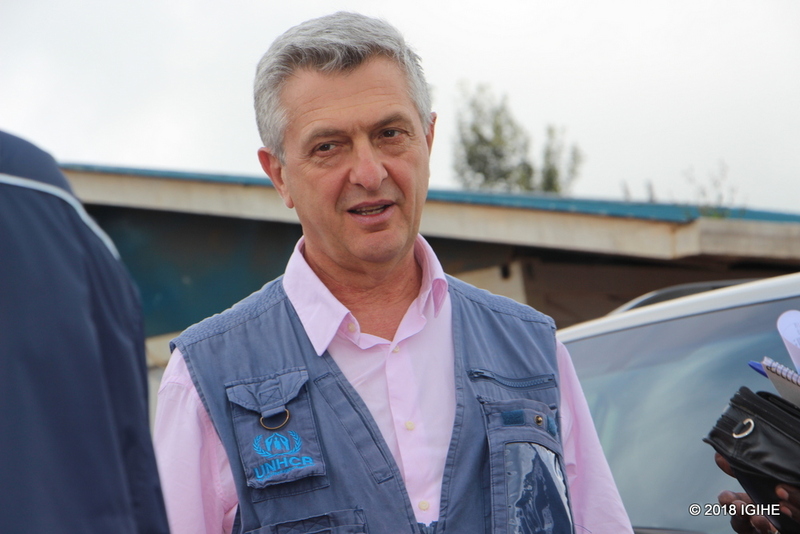 Filippo Grandi was charting with Debonheur Jeanne d’Arc, Rwanda’s Minister for Disasters and Refugee. Refugees were given opportunity to speak out their problems and promised sustainable solutions. 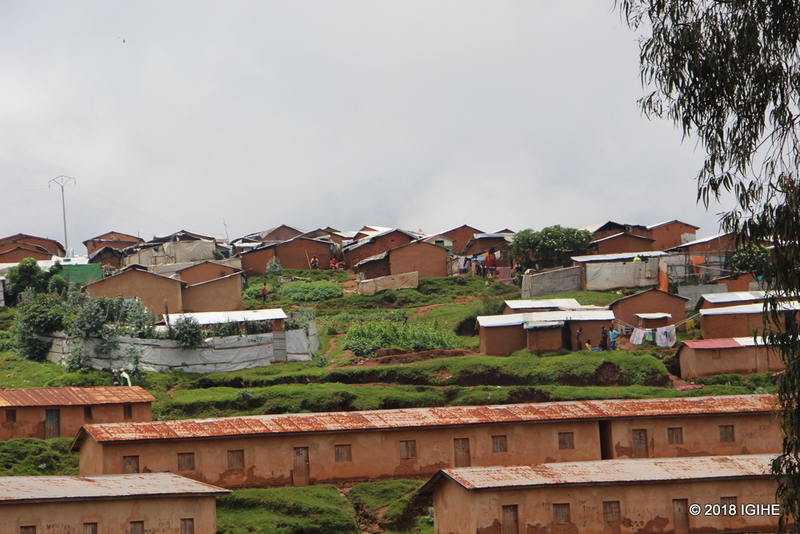 Gihembe Refugee Camp hosts 12,507 refugees since its inception in 1997.